Determine the management practices for commercial lavender production in Massachusetts. Determine the cost of commercial production of lavender for cut flowers and/or oil production. Evaluate the market viability for lavender production in Massachusetts. The following information was learned as a result of this project. Can easily be propagated from softwood cuttings. Hardwood cuttings can also be propagated, but more difficult. Tissue culture from callus derived from leaf buds is possible. To maintain varieties lines lavender should not be propagated from seed. Sandy, sandy loam, or gravelly soils are ideal. 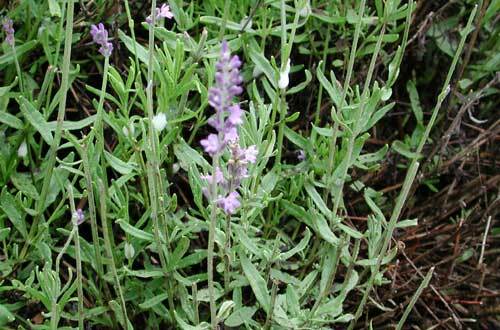 Lavender does well in low-fertility soils. Soil pH should be between 6.5 and 7.5. Between rows: 4 ft., with a range of 3-6 ft.
3,000 - 5,000 plants per acre - 4,000 about average. Plugs: 128 plug tray $50-60, less for large quantities ($30-40). 2" pots: $3-$4 retail, $1.50-2.00 large quantities. Plants should be "hardened" off before being put into the field. In Massachusetts spring planting is recommended. Flower buds should be trimmed off during the first year, and sometimes the second to speed up establishment. Needed primarily in the first year, sometimes second. Some irrigation may increase production in mature plantings. Overhead irrigation may increase disease problems. Overhead irrigation may cause older plants to break open in the middle. Composted manure and bone meal used at planting. Up through year three, around 100 lb. N per acre can encourage vegetative growth. Mature plants need no more than 50 lb. N per acre. Excessive applications of N can decrease oil quality, and make plants unhealthy (also leads to increase weed competition). Phosphorus and Potassium requirements are also very low. Periodic liming may be necessary to keep pH at 6.5 or higher. Probably biggest production issue - critical for good yield and high quality. Landscape fabric/weed barrier - expensive but dramatically decreases weeds. Mulches - with young plants can help - organic mulches can trap moisture against plants. Sand, gravel, oyster shells, etc. can be used. Light colored soils or mulches increase production and improve plant health/vigor. Drip Irrigation to discourage weeds between rows. Herbicides - pre-emergent herbicides effective but registration in question. Cultivator between rows & hand weeding in rows is most common. Mature stands shade out most weeds. Root rot - Phytophthora and Armillaria - proper soil drainage is key to preventing. Spittle Bug - common, unsightly, but causes only minor damage. Approximately 150 stems per bundle. 4-7 bundles per plant - 5-6 average. 12-15 bundles to yield a pound of dried buds. Buds per plant – l/4 to ½ lb. per plant dried buds. Bundles per acre 4,000 x 5 = 20,000. Buds per acre: 1,000 - 1,500 pounds dried buds per acre. Lavandin yield between 20 and 95 quarts of oil per acre (about 35 to 180 lbs.). 1998 prices for lavandin oil, around $10.50/1b., true lavender oil about $22.50/1b. Thus, on the wholesale market, lavandin varieties will generate around $400 to $2,000 per acre for oil production. True lavender L. angustifolia will generate around $120 to $350 per acre. It is highly unlikely that most U.S. lavender producers can compete in the wholesale essential oil business with producers in some other parts of the world. Oil production for small producers should be aimed at high quality, value-added markets. For oil production, mechanical harvesting is a must. Hand harvesting is necessary for bundles, buds, and fresh flowers. U-pick is an option that some farms use on a limited basis. Proper pruning and shaping of plants extends life, improves production. Most U.S. lavender producers must develop their own products & markets, or partner with someone who will. Value-added products are often key to marketing. Culinary uses and markets for lavender are rapidly growing - L. angustifolia is valued around $7.00 per ounce for premium quality culinary quality buds. Lavender can be used to produce products such as lavender jelly, cookies, ice cream, culinary herb blends, lavender tea, honey, etc. Bath products - soaps, shampoos, bath oils, lotions, bath salts, spritzes, etc. Sachets, potpourri, wands, pillows, etc. Bundles, dried arrangements, wall hangings, wreaths, etc. Retail about $6 -$10 per dried bundle, typically around $7.00 (125-150 stems/bundle). Wholesale price about $2-3 per bundle. $30/1b. high end retail price for clean, colorful buds. As low as $6.00 per pound for low quality buds - typically around $ 10.00 per pound is as low the price/pound goes for buds in this area.